I haven’t been feeling well but I’ll get over it! 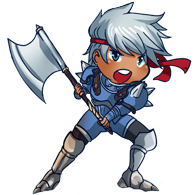 Enjoy a chibi? Hi! Great to know about you after a while! Get well soon. Good luck on this new project and thanks for the cool-looking character.